Gatlinburg has so many destinations for Halloween! River cruises are abundant in the Smokies. After a quick rain, the Little Pigeon River Middle Prong runs. (see gauges on AWW page). III-IV rapids, small channels. Creek type lines. Whitewater rafting trips are a specialty of the Smokies. Check out these companies for a guided great time. It doesn’t get any more beautiful! My husband and I fell in love with the Smoky Mountains the first time we came to visit! So, we decided to purchase our own little piece of paradise. We wanted a secluded cabin, and we found it with Lazy Bear!! We purchased it in May of 2015 and have redecorated and modernized the cabin. We recommend this cabin to anyone who just wants to get away from it all and take in the beauty of the mountains and forests! The location is beautiful and convenient to both Pigeon Forge and Gatlinburg! This area is great for motorcycle enthusiasts! If you are looking for privacy, Lazy Bear is perfect for you! You will be assured that the cabin will be clean for your stay and you will have all the comforts of home. Danielle S. wrote: "My husband and I loved our stay. The cabin offered us the seclusion and privacy that we needed. Would definitely recommend! " 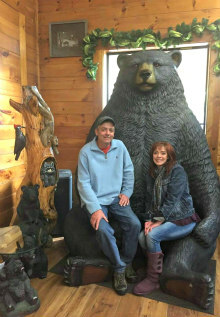 Copyright © 2019 Lazy Bear Cabin Gatlinburg Pigeon Forge. Powered by WordPress. Theme: Accelerate by ThemeGrill.